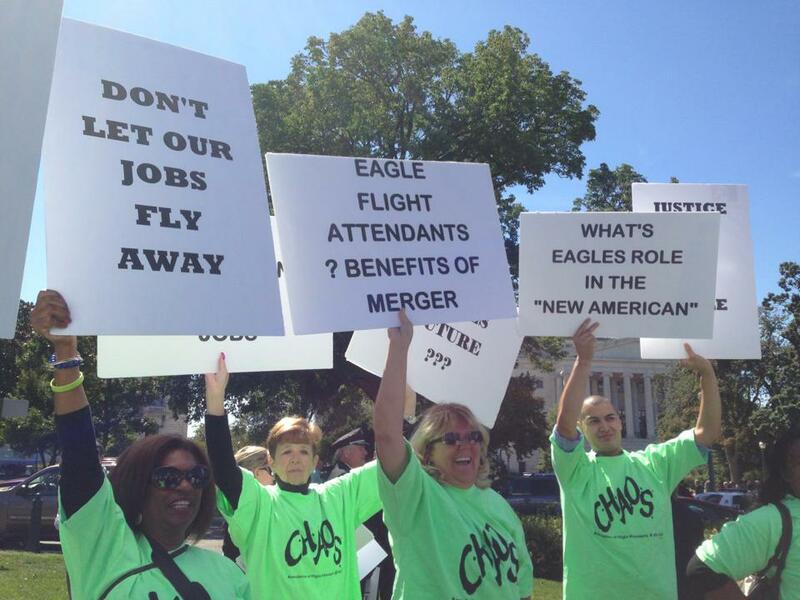 CHICAGO – On Thursday, April 11th, United Express carrier Air Wisconsin flight attendants, who are represented by the Association of Flight Attendants-CWA (AFA), will hold a demonstration at O’Hare International Airport. The Air Wisconsin flight attendants will be joined by AFA union leaders, flight attendants from across the country, and allies at Thursday’s protest. The flight attendants will make their voices heard as they demand a fair contract that includes increased pay, improved benefits, and an overall better work environment. They will be pushing to ensure they have the resources needed to do their jobs and keep the flying public safe and secure. Given that Air Wisconsin flight attendants fly under the United Express brand and tickets are sold as United Airlines tickets, they are urging United Airlines to step in and help settle the dispute with Air Wisconsin. Despite numerous federally mediated sessions, Air Wisconsin has refused to move on their bargaining position. 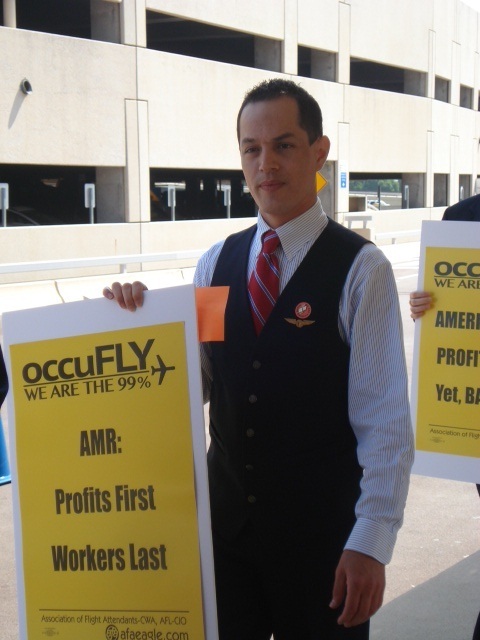 Last fall, Air Wisconsin flight attendants authorized a strike by a 99% vote. The Association of Flight Attendants is the flight attendant union representing 50,000 flight attendants including those at Air Wisconsin. was established in October 1974 by the Communications Workers of America Executive Board to honor the name and memory of the founding President of CWA, who served for more than 30 years. In his capacity as the first CWA President, Joe Beirne took great pride in the roles he played in the fields of education and learning and other areas of social concern. Deadline April 30, 2018 11:59 P.M.
More Information here . . . Active and Retired Members and their families can earn an associate degree completely online – for FREE. Problems or concerns with your tablet? AFA has found out that all calls to the 800# for issues with the tablet go directly to AA and not to our management. AFA Safety needs to know what is happening so we can advocate for everyone. Please fill out the form here. It’s COLD outside . . . Please keep sending in your temperature reports…..Cold ones too! Do you sweat or freeze in the airplane cabin? Download our App to report it! On June 21, 2017, American Airlines announced it will seek a new uniform vendor due to the many illnesses reported by AFA members and others exposed to the current uniforms provided by TwinHill. AFA has communicated with management about our experience and research on uniform garment issues and this process of selecting a new uniform vendor. It is critical that the new uniforms will be safe and healthy, as well as durable and comfortable, for our members. DO visit AFA’s uniform reactions reporting site and report any uniform reactions to AFA, in confidence. To all AFA members who have experienced averse reactions to the new uniforms there is a website that AFA-CWA has designed to give you all the information you need to know about the Twin-Hill uniforms and your reactions. Even if you haven't had a reaction, you are still encouraged to go on the website to educate yourself on this topic. On the website you are given detail instructions if you experience any reactions. Also we have Information on how AFA is presently advocating for you. There is even detail information on the chemicals that may be found in different uniform pieces that may cause skin irritants. Please take the time and log onto http://www.afacwa.org/uniforms. Here are some 'Fast Facts' about our contract and some of the new protections in place. The Family Medical Leave Act provides time off when you need it most to care for yourself or your loved ones. Find out how what your rights are in this updated article. Want to know the latest news? Get the official scoop right here from your elected leaders! The Association of Flight Attendants-CWA (AFA-CWA) is the world's largest labor union organized by flight attendants for flight attendants. AFA represents nearly 60,000 flight attendants at 21 airlines, serving as a voice for flight attendants at their workplace, in the industry, in the media and on Capitol Hill. Simply put, the goal of flight attendants who become part of AFA-CWA is to negotiate better pay, benefits, working conditions and work rules at their airline, and to improve their safety on the job. AFA-CWA negotiates the best flight attendant contracts in the industry, maintaining and improving wages, benefits and working conditions for flight attendants. AFA-CWA has strength in numbers and a professional staff to assist flight attendants with workplace, career and interpersonal concerns. AFA-CWA is a democratic union representing flight attendants at every type of carrier. All AFA-CWA officers are flight attendants who solicit member input on policy and financial decisions. AFA-CWA is the only flight attendant union solely representing flight attendant's concerns affiliated with the AFL-CIO, the 13-million-member American labor federation. AFA-CWA shares information and strategies, working in solidarity with flight attendant unions around the world through the International Transport Workers Federation (ITF).